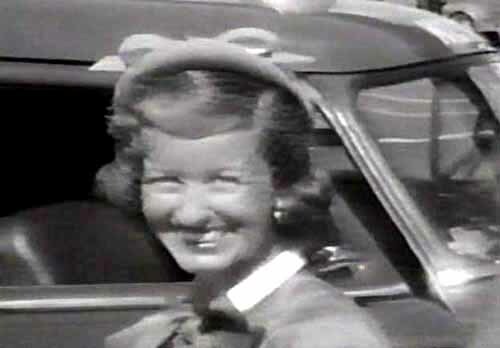 It's Thursday morning June 10, 1954 at old Los Angeles airport. There Toni Mannix is offering her good-byes to George Reeves and wishing him a safe return. Standing nearby is Noel Neill, Jack Larson and John Hamilton. 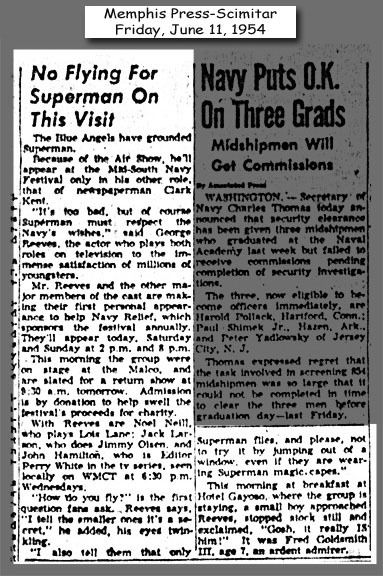 Soon the cast of the Adventures of Superman would board a scheduled flight to Memphis, Tennessee. There the group would appear at a fund raiser benefit for a Naval Relief Fund at the Naval Air Station Memphis (see article below) beginning Friday and ending Sunday. Also appearing would be the dynamic flight demonstration team, The Blue Angels. The flight would make a short stop-over to refuel in Dallas, Texas at Love Field airport (see supporting images below). An advanced publicity tipped off Channel 5's news crew, along with a good crowd of fans who were on hand to greet the entire cast. There the cast signed autographs for the adoring youngsters and soon continued on to Memphis. The cast members arrived in Memphis to gloomy weather. Shortly they were asked to appear in front of an audience of children the following day at a movie theater (Malco, see article below). 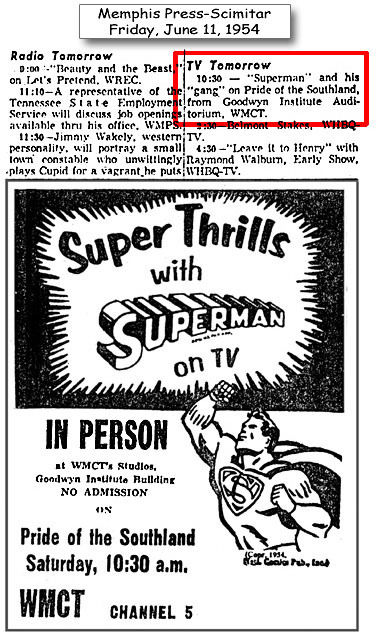 The children would be treated to two film episodes of TV's Superman. Once the episodes were finished the cast would come out to greet the children who bought tickets to the show. The appearance was arranged by a National Comics public relations representative. After settling at the hotel, to pass the time Jack wandered around Memphis. He remembers all too well the heavy downpour of rain he got stuck in that day. To protect himself from the rain he found a dry spot under a hotel tin awning. It seems Jack just can't seem to avoid water. During the day Jack would see a very unfamiliar and disturbing sight, a water fountain with the words "colored." He knew all too well what the words meant and it didn't sit well with him. Later Jack would meet with his friends and learned George had also discovered Memphis was a segregated town. George was born in Iowa, spent a small time of his childhood in Kentucky and the balance of his life living in Pasadena and Los Angeles. While not truly raised in the South, Noel always considered George a "Southern gentlemen." Almost 100 years after the American Civil War the South still remained segregated in many states. Memphis was a town that favored segregation. It is no secret the atrocities the African-American people of the time had to endure in this country. The years that followed 1954 would mark the beginning of the Civil rights movement. Most notably with the killing of 14 year old Emmett Till in 1955 in Mississippi. The African-American people's right to vote wouldn't be disputed until The 15th amendment to the Constitution and the Voting Rights Act of 1965. While politics was a subject the cast tended to avoid with their discussions, Jack recalls George being a registered conservative Republican and pro Richard Nixon. Seeing the words "colored" did not sit well with George. The thought of people being treated as unequal was not his idea of the American way. 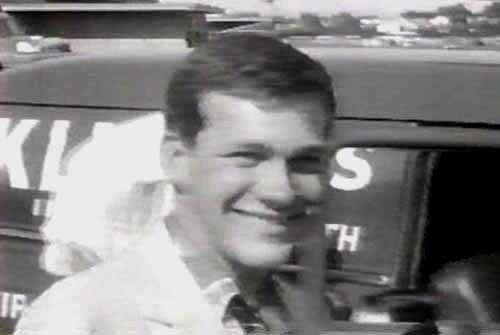 Jack Larson recalls George discussing the issue with both Noel and John. Knowing the town supported segregation it was learned the African-American children would be required to sit in the balcony of the theater separated from the Caucasian children. To George and his friends the choices they faced were obvious. A) Appear at the show and ignore the separation due to the color of skin. The message the African-Americans children would certainly come to realize is the Adventures of Superman people are supporting racial inequality. This most certainly would have broken the hearts of many children and added the feeling of being less important. B) Cancel the show unless everyone is treated equally and fairly. George and his friends knew the choice they had to make. The next day Jack was informed by George the show was canceled. Noel and John had agreed with George's decision not to appear if the children were not to be treated equally. It is obvious from the outcome the promoters did not agree to integrate the crowd. With the promoters now a non-issue George and the others agreed to appear at the Malco movie theater, no tickets would be sold and therefore separating the children for any reason wouldn't be a concern. A table was set up with George, Jack, Noel and John seated accordingly. The children were lined up for two blocks to meet the stars of their favorite television show. The cast would greet the children for several hours signing autographs, shaking hands and given best wishes. The smiles and happy faces lasted for hours. George Reeves: "Our writers and sponsors have children and they are all very careful about doing things on the show that will have no adverse effect on the young audience. We even try, in our scripts, to give gentle messages of tolerance and stress that a man's color and race and religous beliefs should be respected." George Reeves: "Safety to me means just using your commen sense...you're taking your life in your hands when you play in the streets...and remember, policemen are your friends." It was a long day and George professed to Jack how tired he was getting. Seeing the long line that still remained he mumbled under his breath about its length. A mother listening in jokingly asked George whether or not he liked children. In his best W.C. Fields voice he responded, "Like children? I love children. I have one for breakfast everyday." It drew laughs from those nearby. 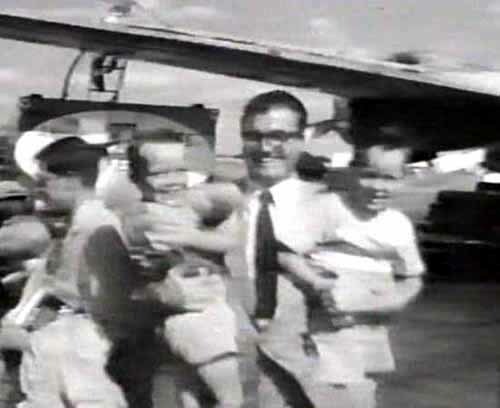 Once the movie theater event was finished, George, Noel, Jack and John were invited back to the Naval Airbase to have dinner with the Blue Angels pilots and their wives. Jack recalls it as being a wonderful time. The wives were all very friendly and a good time was had by all. The action to stand against segregation fortunately created no immediate incidents. As a humanitarian, it speaks highly for George and his loyal and supportive friends. There's no telling what could have happened in those days. It would seem likely George certainly would have rose to the occassion by speaking diplomatically to difuse any adverse situation. But hate takes no prisoners, the risk was high considering the times and the state of affairs. Thankfully all remained well that weekend at the Malco movie theater. Click here to watch the segment in its entirety on You Tube. "On January 1, 1943, the Naval Reserve Aviation Base was renamed Naval Air Station Memphis. NAS Memphis continued its support and logistics role for some 50 years." This means that when George visited, it was called Naval Air Station Memphis. In addition to the above article and local advertisment Randy provides he also came across this interesting message board communications about the air show which did not end on a happy note. 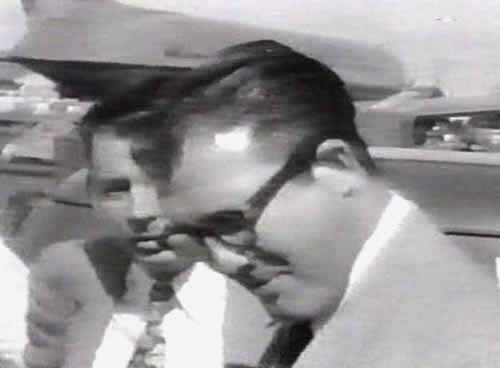 Walt Edminster: I was an AT1 stationed at Memphis when the F7U crashed at the 1954 annual air show. The Blue Angels came every year and I was always assigned to maintain their electronic equipment. This year they added a couple F7U Cutlasses to the show. These were not flown by the Blue Angles but by two test pilots. As I remember one of them was Cmdr. Puckett, the other a Lieutenant. The F7U looked like a preying Mantis. It had a tall nose wheel that made the plane stand up at almost a 45 degree angle giving it an angle of attack during takeoff that allowed it to get off the ground very quickly. I was working both the Blue Angels F9Fs and the F7Us this time. At noon I went to lunch and was on my way back to the flight line when Cmdr. Puckett took off, banked hard left and flew right over the water tower I was walking under on the way back to the flight line. The Lieutenant followed with the same maneuver in his F7U but almost hit the water tower (If he had I wouldn't be writing this). He barely missed the tower apparently stalled trying to avoid it and came right back down into a Navy school building. Fortunately they'd just turned out all the classes for lunch and there were only a few people left in the building. One was a woman who was blown out of the building and onto the grass. A Chief and I were the only ones near by so we picked her up and carried her over to the dispensary which was only 200 ft away. She died before we got her there. If it had been 10 minutes earlier it would have killed over 150 people. Walt Edminster, Ex AT1, Retired after 50 years in the Space Industry. NOLEN D MAXWELL: PANAMA CITY, FL MY DAD WAS FIRE CHIEF AT NATTC MEMPHIS THE YEAR THAT THE F7U-3 CRASHED INTO THE SCHOOL. ALSO REMEMBER DAD COMING HOME AND TELLING US THAT EVERYONE OF THE KIDS THERE WANTED TO KNOW WHY SUPERMAN COULD NOT SAVE THE PILOT . 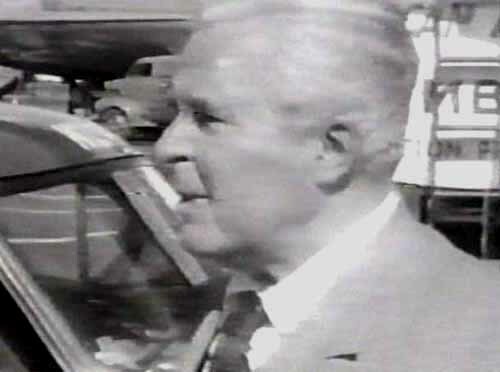 GEORGE REEVES WAS THERE AT THE AIR SHOW . Click here for this and other information regarding F7U-3 aircrafts. It's no wonder the children would question why Superman didn't save the fallen aircraft since they were most likely very familar with the 1953 episode Jet Ace. There Clark Kent makes his quick change into Superman in order to save test pilot Chris White, Perry White's nephew. We know all too well George Reeves is not really Superman. Sadly, the fantastic image of Superman saving the pilot can only remain a fantasy in the world of reality. George Reeves could not perform the astonishing heroics and amazing feats of Superman. But as a humanitarian he could do his part to be something more than just human. 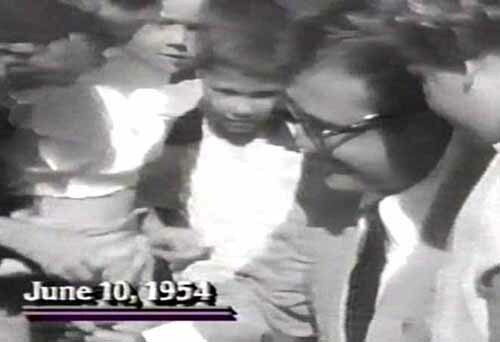 In Memphis he helped those children remain innocent from hatred and ignorance that gripped the country on a daily basis. George, Noel, Jack and John took the time to meet the children and during this special moment those young minds could forget the dark shroud that caused the country to walk in fear. What George, Noel, Jack and John did was courageous and unselfish. The children would "look up", but find more than Superman's mighty blue sky. They would see George Reeves, with his comforting and gentle smile to remind them there is good in the world and hope. In closing, I want to thank Jack Larson for contributing his knowledge and helping to clarify the Malco Memphis movie theater segregation issue. Thanks to Randy for his research and article contributions. I hope you've enjoyed this feature as The Adventures Continue.